Get your bulldozer on site as quickly as possible with this wooden low loader. 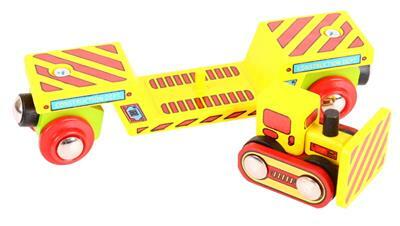 With magnetic couplings the wagon can be pulled by any engine in the Bigjigs range. 2 playing pieces including the detachable bulldozer. Why clog up the roads when you've got a tailor made Low Loader to take your bulldozer by rail? Get your bulldozer on site as quickly as possible with this wooden low loader. The detachable bulldozer sits securely on board and lets the rail network take the strain! Magnetic couplings ensure compatibility with all other engines and carriages in the Bigjigs Rail range. Consists of 2 play pieces. Most other major wooden railway brands are compatible with Bigjigs Rail. Made from high quality, responsibly sourced materials. Conforms to current European safety standards.